I joined the Salkantay trek with my sister and my mom, and it was such a nice bonding experience. The first day was a little tough on us because we didn't quite know how to pace ourselves in such a high altitude. My mom and my sister were fine, but I suffered a little altitude sickness because unlike my mother and my sister, I had arrived just two days earlier than the trekking start date. 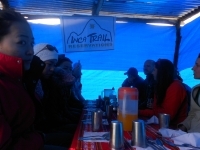 However I was immediately better with some prescription altitude sickness pills that I brought from home, and some coca tea that they served every morning and at every meal time. The second day, we were able to pace ourselves better, and the guides were extremely helpful to accommodate everybody with various trekking speeds, which was great because my mom was a little worried at first that she'd be lagging behind. The second day was super challenging with the highest altitude that went up to 4000 something meters. After we were finished with the uphill though, we felt really nice and proud of ourselves that we made it. From the third day it was all gentle up and downs with plenty floras and faunas to observe. I would definitely recommend this tour to everybody, no matter the age.